Spring officially begins this month on March 20, but I am hurrying it along by putting French lavender bedding plants on the breakfast table in the sunspace. If spring cannot come fast enough for you either, here's how to create a little early spring with French Country touches. Four-inch bedding plants make the biggest impact by using multiple plants grouped together. A lone four-inch plant will look lost by itself on a big table or in a large centerpiece. Since odd numbers of items, for some reason, are more pleasing to the eye than an even number of items, use a cluster of three or five lavender plants together. 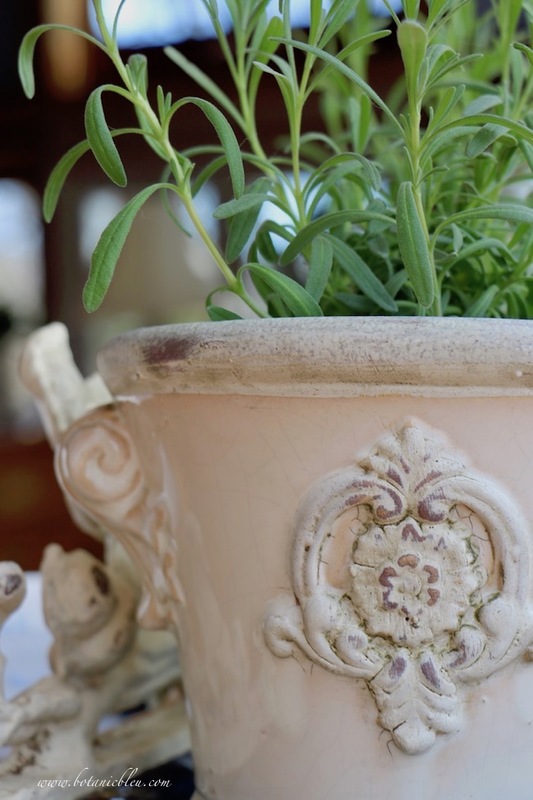 What better way to display French lavender than in a French-style flower urn? Leave the bedding plants in their original plastic pots for a couple of reasons. First, the hole in the bottom allows drainage. Water the four-inch pots by removing them from the French urns and by gently running water over them in the kitchen sink. Allow them to drain before returning them to the French pots. If your French-style flower urns also have a hole in the bottom, use a small plastic saucer in the bottom of each urn to catch any excess water as it drains through the plastic pot. Secondly, leaving the bedding plants in the plastic pots makes it easier to remove the lavender plants from the French-style urns for transplanting them into your garden outside. Enjoy the plants inside until there is no longer a danger of frost. The average last freeze date in the Dallas/Fort Worth, Texas area is March 13, still almost two weeks away, and one week before spring arrives on the calendar. Place the French urns on a ceramic platter, in a box, or on a rattan tray to bring them together as a single display. Use a waterproof container if the lavender plants are displayed on a wood table or other surface that can be damaged by water. Clay pots can allow water to soak through if they are not sealed. Add other things to the lavender plant display to vary heights, add color, and add texture to the display. The three lavender plants are on the sunny side of the blue melamine platter facing the windows. A white-painted chippy length of vintage iron scrollwork supports a special note propped on the other side of the blue platter. A roll of blue printed wrapping paper and a blue ribbon lie behind the envelope. A blue embroidered tabletop scarf softens the display. 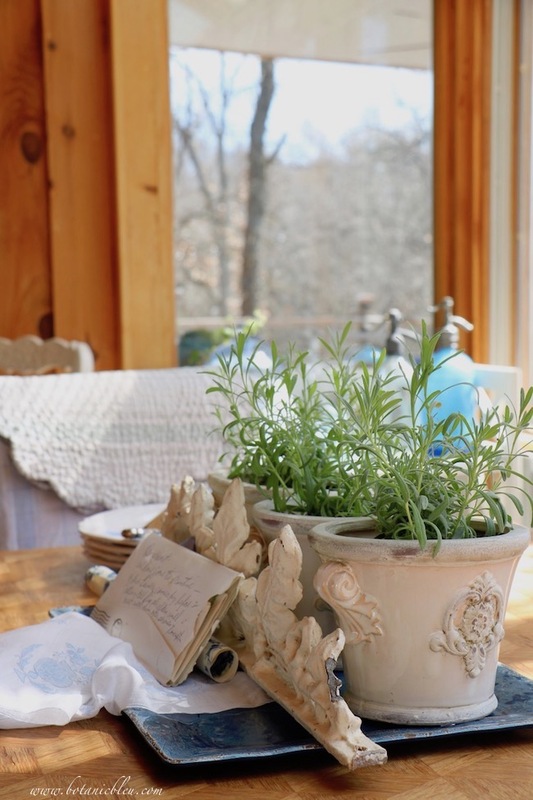 Winter is still visible outside, but French lavender adds a touch of spring on the breakfast table inside. 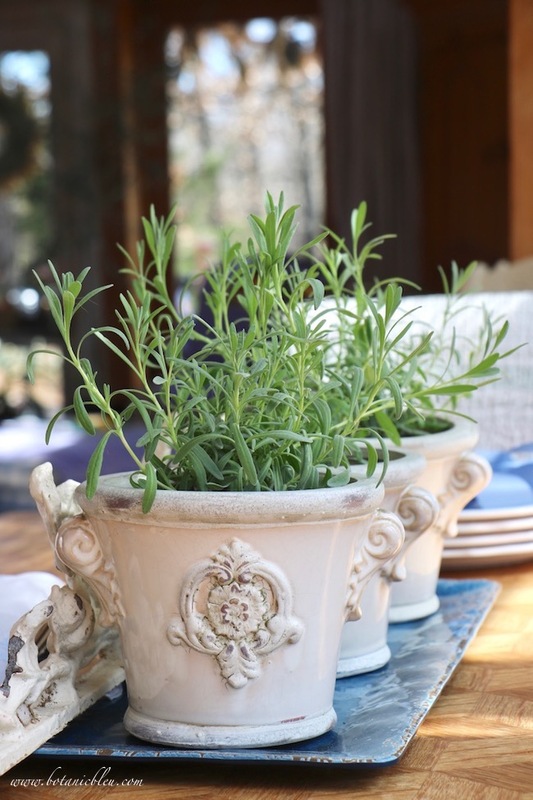 If you are ready for spring, head to your local nursery for four-inch French lavender, or other herbs, to create an easy little touch of spring on your breakfast table. 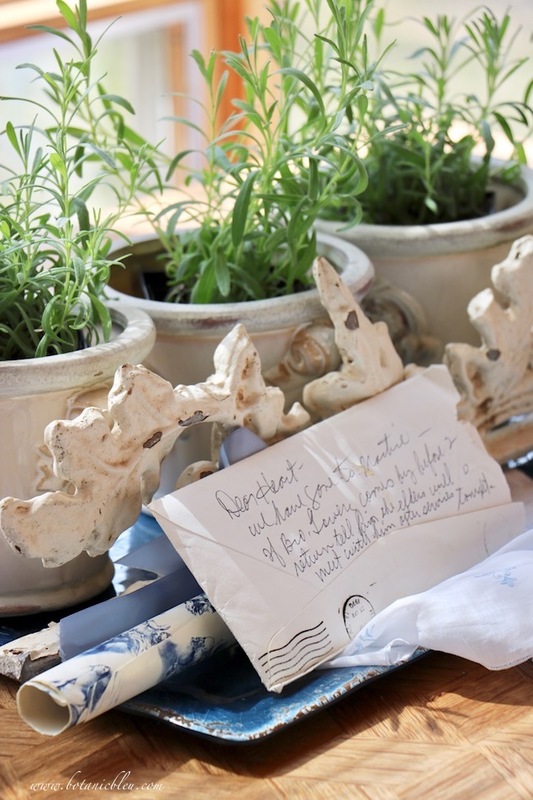 That special note in the French lavender display arrived in the mail last Friday. The contents of the envelope were what we were expecting, but the Dear Heart note on the back is the real treasure. 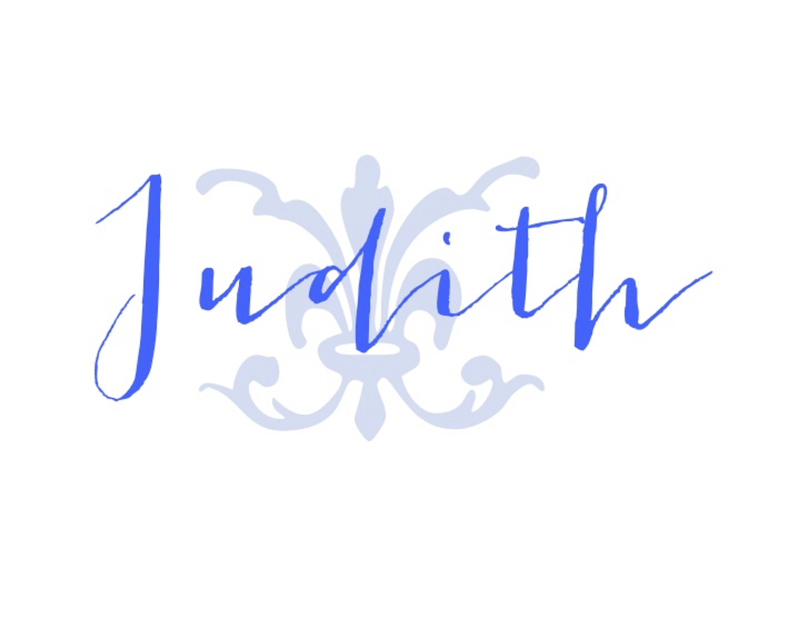 Come back for my next post when I share that letter from 1970, the contents, the Dear Heart note, and what it all means to our family. Great post. Do you have a source for the urns? Love the idea. Thanks for sharing. Beautiful! I can always see that you put so much thought into the simplest things. The results are always amazing. Oh, the fragrance! I can smell it acorss the country and right here in Michigan! The French-style ceramic pots are available in my online store. Please send me an email through my Contact page for details. Your comment is a 'no-reply' email comment, or I would have emailed you directly. Love how the lavender looks in those French Pots. So pretty!!! Lavender calls me and I know it does you too. My dream of growing a field of lavender will forever be in my heart. 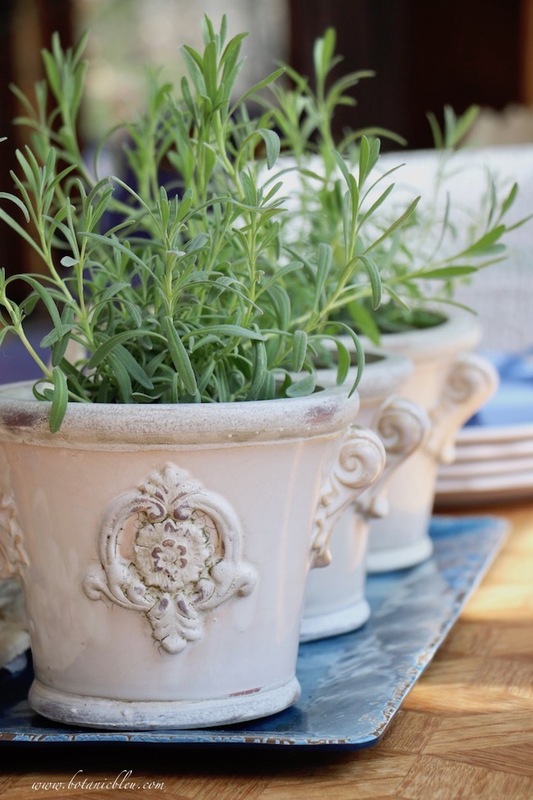 The lavender is just perfect in your charming pots. What a great idea to enjoy it inside first and then plant it outside later. Just gorgeous. I love lavender and they are so pretty in the urns. A wonderful way to bring Spring indoors. Gorgeous! I love the pots but may I ask where did you get the lavender plants?